Calling all posh ladies! 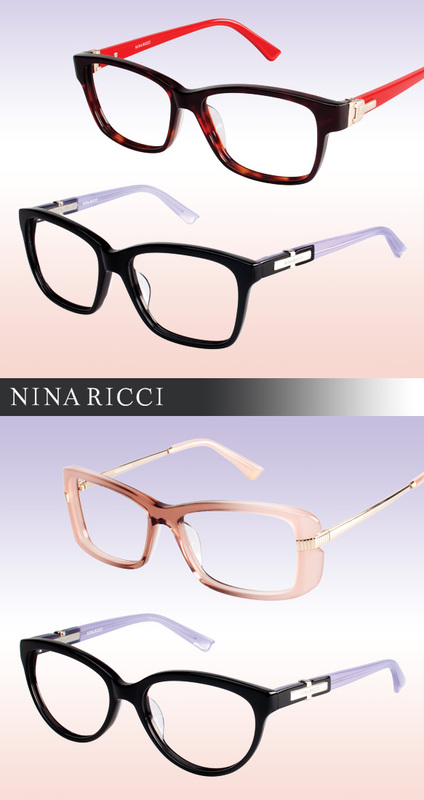 Get a taste of France with the latest Nina Ricci specs, featuring elegantly sophisticated styling that’ll make any debonair dame swoon in eyewear glory! Crafted in the romantic country itself, these frames perfectly exude femme flair. Between the intricate detailing and trendy, yet refined, silhouettes, we can’t get enough of ‘em! Laser engraving creates texturized effects, while metal bow embellishments and buckle additions boost the chic factor. Some even have Nina Ricci’s prestigious Paris address engraved on the inner temple! To boot, two-toned colorations in light pink, bold red, gold and lavender hues, with hints of tortoise and black, bring these glasses to life. Meanwhile, their retro rectangle, polished wayfarer, demure cat-eye and hip square profiles add a dash of glamour! Overall, we have to admit, we’ve never set our sights on such a charming collection!